Seamark, E.C.J., T.C. Kearney, and J. Watson. 2012. 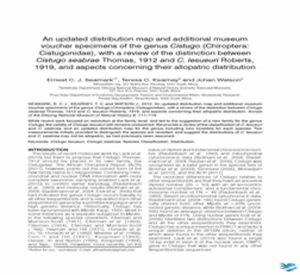 An updated distribution map and additional museum voucher specimens of the genus Cistugo (Chiroptera: Cistugonidae), with a review of the distinction between Cistugo seabrae Thomas, 1912 and C. lesueuri Roberts, 1919, and aspects concerning their allopatric distribution. Annals of the Ditsong National Museum of Natural History. 2: 111-119. While recent work focused on resolution at the family level, and led to the suggestion of a new family for the genus Cistugo, the validity of Cistugo lesueuri still remains unresolved. We provide a review of the classification of C. lesueuri and C. seabrae, and an updated distribution map for the genus including new localities for each species. Two measurements initially provided to distinguish the species are revisited, and suggest the distributions of C. lesueuri and C. seabrae may not be allopatric, as had previously been assumed. Dietrich, M., T. Kearney, E. C. J. Seamark, J. T. Paweska and W. Markotter. 2018. Synchronized shift of oral, faecal and urinary microbiotas in bats and natural infection dynamics during seasonal reproduction. Royal Society Open Science 5: 180041. Dietrich, M., T. Kearney, E. C. J. Seamark and W. Markotter. 2018. The excreted microbiota of bats: evidence of niche specialisation based on multiple body habitats. FEMS Microbiology Letters 364: fnw284. Van Cakenberghe, V., G. C. Gemba Tungaluna, P. Musaba Akawa, E. C. J. Seamark and E. Verheyen. 2017. The bats of the Congo and of Rwanda and Burundi revisited. European Journal of Taxonomy 382: 1 – 327. Seamark, E. C. J.. 2017. Conserving cave ecosystems and public health. South African Speleological Association 42: 42-48. Dietrich, M., M. A. Tjale, J. Weyer, T. Kearney, E. C. J. Seamark, L. H. Nel, A. Monadjem and W. Markotter. 2016. Diversity of Bartonella and Rickettsia spp. in bats and their blood-feeding ectoparasites from South Africa and Swaziland. PLoS ONE 11(3): e0152077.